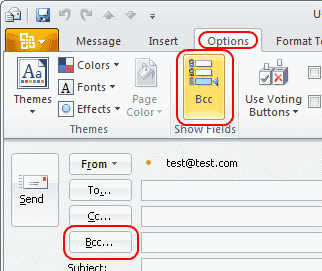 Show the BCC (Blind Carbon Copy) field when sending an email from Microsoft Outlook 2016 to send a blind carbon copy to recipients. This field allows you to copy other recipients in on the message without other recipients knowing all the recipients it was sent to. Here’s how to turn on the field. Start your new email message or reply by selecting “New Email“. The field is now turned on and ready to use to blind carbon copy recipients. If you’re using Outlook Web Access instead of the Outlook client, you also have an option for revealing the BCC field with these steps. Select “New mail” to start composing your message. Select the three dots (…) located toward the middle to upper-right portion of the message screen. I can’t find the BCC button under Options. What do I do? Your copy of Outlook may have been customized. You can bring the BCC option back by selecting the “Customize Quick Access” arrow at the upper-left portion of the window, then selecting “More commands…”. From there select “Quick Access Toolbar” to modify the options available. If you want to take the easy way, just select the “Reset” button. to modify the options available. In some environments, it is possible that your IT administrator turned this feature off. How can I tell who was sent a BCC on an email message? A blind carbon copy is intended to be “blind”. You cannot see a record of who was sent a BCC within Outlook if you are a recipient. However, if you sent the message, you can open it from your “Sent Items” folder and see who was sent a BCC message.